Happy 80th Birthday Jim Brown! Though it has been 50 years since he last carried a football in the NFL and most of his records have long been broken, Jim Brown still stands among the greatest ever to play professional football and is arguably still at the top of that list. We wish this legend and American treasurer a happy 80th birthday! 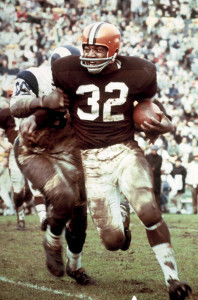 When he retired following the 1965 season at the age of 29, Brown held the NFL record with 12,312 career rushing yards. Though his mark was first passed by Walter Payton in 1984 and has since been eclipsed by seven other players, Brown remains the only player in NFL history to average more than 100 yards rushing per game (104). Brown was the epitome of a player retiring at the peak of his greatness. In his final NFL season, Brown rushed for 1,544 yards and 17 touchdowns as the Cleveland Browns reached the NFL Championship Game. In the 1963 NFL season, Brown rushed for 1,863 yards, which was the NFL single season record at the time. The following season, he gained 1,446 yards rushing and then had 114 yards to lead the Browns to what remains the last NFL Championship for Cleveland. During his nine NFL seasons, Brown led the NFL in rushing an amazing eight times. At the time of his retirement, Brown’s career rushing total was nearly 2,600 more than second place Joe Perry. He also scored a then record 106 career touchdowns. In the ensuing 50 years since he last wore an NFL uniform, Brown has spent time as an actor, but most importantly he has been a vocal leader in civil rights and supporting inner city youth. It is amazing to think that not only was Brown a great football player, but he was also one of the best college lacrosse players of his era. He was recently prominently involved when Hampton University, a predominantly African American school in Virginia, recently started a varsity lacrosse program. It is interesting that arguably the greatest player in NFL history shares a birthday with the greatest player in NBA history, Michael Jordan. In fact, when ESPN ranked the top athletes of the 20th Century, Jordan was first and Brown fourth. Because many of today’s football fans were not born when Brown retired, he is not always remembered in discussions of the all-time greats. However, there is no debating that Brown was a once-in-a-lifetime player and any chance to remember and celebrate his greatness should be utilized. In honor of his 80th birthday, below are links to some highlight films that illustrate why he was the Superman of his era.